Well it has arrived our final day of cutting wheat. 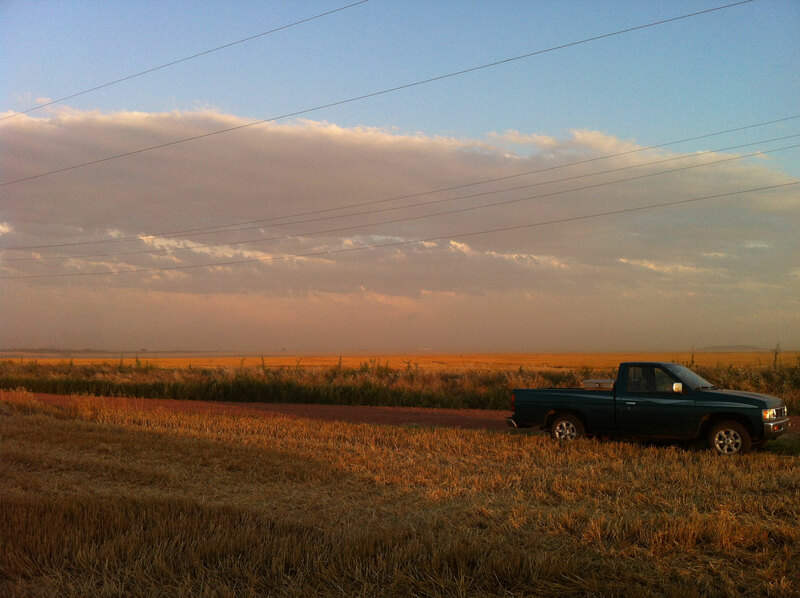 I was hoping that Zac would be able to narrate this post for the blog and give a complete report of harvest in southwest Oklahoma, but he is still on the combine. I am writing this Friday morning, the first day of June. He is moving to the last two fields that are across from each other – about 210 acres left. He says that with no major problems he should finish today. I am hoping in time to surprise Kenda at her softball game. I am certain he just wants to be finished before the next chance of severe weather has time to strike. This seems like such an odd year. Huge wheat harvest, great yields and most were DONE in the month of May. It is just unheard of to be done this early plus following a severe drought that we endured last year. There must be no other explanation but that God is always so good and He enjoys showing what He can do when we trust Him. We watched God split storms to go around us, watched Him stop fire and protect homes and watched Him deliver the crucial moisture we needed at specific times. Mowing down the wheat stubble after harvest. Zac says he is really excited to see the final numbers come in on the average of bushels per acre. The yield monitor is showing some really exciting numbers. I agree with Zac when he said every year you put a crop in you hope for a year like this is proving to be. When you are in the fields, you can see all kinds of God’s beauty. Zac has been able to see coyotes and all sorts of wild animals. An amazing dust storm blow over the mountains and the magnificent clouds as well as endless lightning storms were breathtaking. All of this set before him while driving a combine. Zac will be the first to tell you, “there is nothing more beautiful than the seat of the combine!” After nine years of harvesting with him I have to tell you I agree! But a close second is seeing the piece of himself he puts into every crop every year and feast or famine he feels every inch of the soil. It takes a special man to turn the soil, to care for the crop and watch it grow for months. Then in an instant, it’s gone; either by Mother Nature or by the man himself! As the last few combines roll by, take the last few looks around because wheat harvest 2012 is almost completely in the books! Beautiful clouds as a storm moves in near our farm. What a week – Zac really thought he could keep you updated more frequently but apparently he is failing! Ha! So I, Amy, have been nominated to write this week’s blog entry. I hope I don’t get fired! 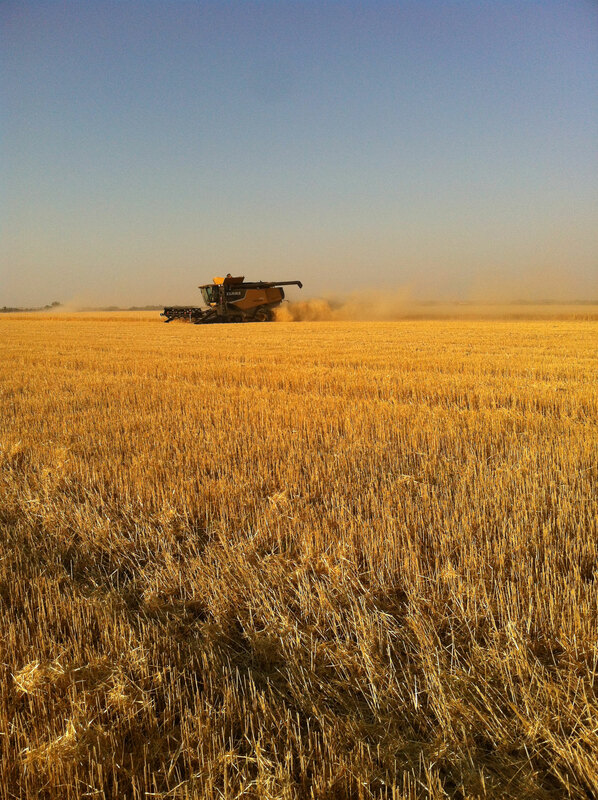 We have been cutting LOTS of good wheat … such a blessing. We are finally about half done or maybe a little over half as of 11 p.m. on May 23. We have had quite an exciting evening. 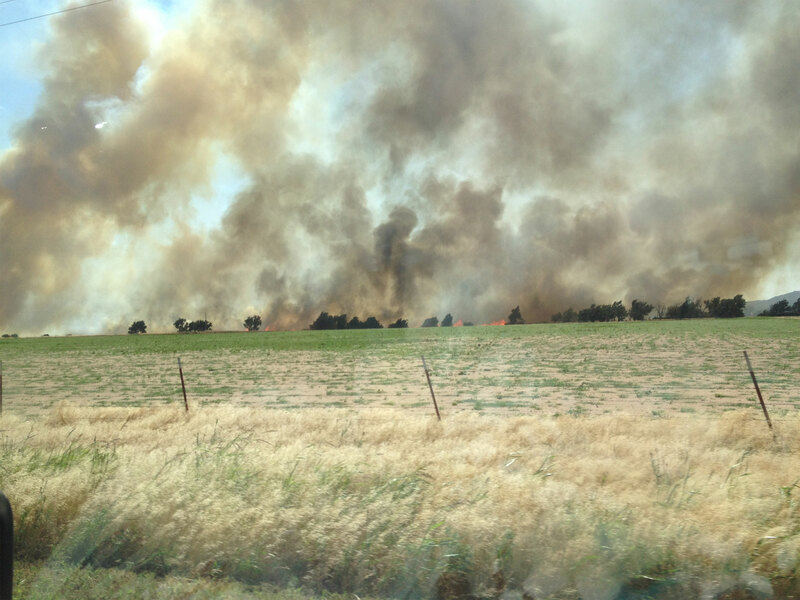 A fire struck out on a neighbor’s wheat stubble about 4 miles south of Zac’s dad’s house. All hands on deck left harvest equipment to grab a water hose or drive plows or load vehicles with irreplaceable items. With all this wind, God was just good to stop the fire without any structure fires and without it going to the far North Country. In all the drive by vehicles, it was nice to have some Farm Bureau friends, The Null Family. Janice was so helpful in everything from spraying the house down to helping load items from inside. Her two young men, Brian and Colvin, were a blessing too. They showed up with the water trailer and did a great job saturating the roof and ground around the house and diesel tanks. This is what it means to be a Farm Bureau family. Even when it is every wheat farmer’s prime time to make money; the family you have in Farm Bureau stops harvest to come lend a helping hand. We’re praying no hot spots spark up in the next few days. It certainly won’t take long in this wind to get some damage done in a hurry. We seem to still be averaging well over 40 bushels an acre. I can’t wait to see the final farm averages. Zac says we just can’t seem to get any acres in a day because we are driving slower than we have in a few years because of the amount of bushels being run through the combine. Volunteer fireman Trapper Heglin took this picture. Four fire stations and 8 hours later, the fire was out. 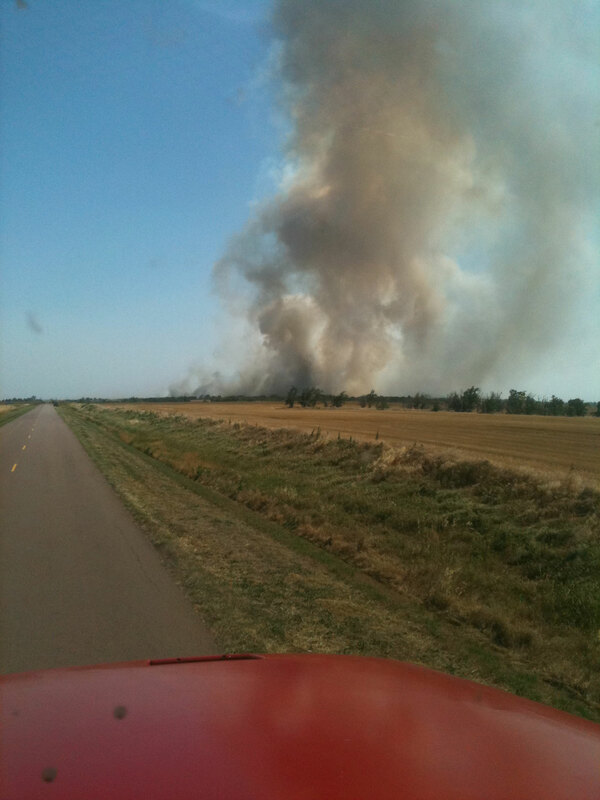 Another look at the wheat stubble fire. We are still in the middle of softball and competitive t-ball and the last day of school is tomorrow! This is me doing my happy dance! You should see it – it’s pretty priceless! Even with school ending, it seems we won’t be slowing down too much. Well I still have dishes and laundry to do, backpacks to prepare for the last day of school, teacher gifts to get ready, meals going for tomorrow night’s supper and the task of picking up what all the little fingers found today! Have a blessed night. Harvest is in full swing and we are 3 days closer to being finished. You know, it really doesn’t matter what type of agriculture you are in; each year you swing for the fence. What I mean by that is we are hoping for a home run! Ok, so maybe too many baseball analogies but when any farmer or rancher is planning their harvest for the next year, we are hoping that it will be that crop or set of animals that will truly “cash in” and put us ahead. After last year’s severe drought, we weren’t over-the-moon-excited to plant this crop, we weren’t even sure it would come up out of the ground. God is always so good. He not only provided the moisture to emerge the crop in the fall but also provided ample water to make this year a record crop. We were diligent to put in fertilizer and spray for disease and insects because every year we hope for the best. This year looks like it will not disappoint. We have cut about 600-700 acres. We have wondered about this crop and its potential from the beginning. We have seen how beautiful it looks and continued to pray for God’s protection during the storms and wind. So far, the fields have been averaging well over 50; this means we are averaging 50 bushels per acre. If it keeps this pace, it will be a record crop! This is very exciting. We have cut our faraway places first so we’ve had to do a lot of road travel. As we move to the closer fields, the pace of cutting will begin to pick up. We will update more as the week goes on … it may just be some pictures and hopefully a video! Check out the gallery of pictures below. It’s definitely a clear picture of our life right now! Have a blessed day. Our son, Rylan, swinging for the fences at his baseball game. Trale – the best combine driver on the farm. The beautiful sight of cutting wheat. Dumping wheat on the go. Harvested wheat in the auger.